Hi, it's my first topic here - progress of my work for pj challenge. The shapes come off more disk-shaped than spherical. - Try cutting back on the background blue on your fruit; makes it blend in. Ramp up that underused grey instead: you need to fully leverage all the values you have. - Why has everything got a rimlight? plot from the lightsource to the object and light that stuff up. - Similarly, highlight position is not at the closest point to the lightsource: angle of incidence = angle of reflection; you can google examples. - Candles tend to light up internally rather than casting a strong shadow on themselves. - I wouldn't put put a highlight on the 'nana; they're kinda matte. Also, holy balls lot of activity here. I chose this palette myself, I couldn't create anything better (you can see in the first post how was it looking before). The deadline was about two days ago so now I can make this better for myself and probably I will, I'll try to make shading better as you did on your sketch. at first i'd like to know if proportions are drawn well, could you spend a moment and tell me? Remember that bones don't bend. You're gonna have to make it more detailed if you want any decent criticism, right now it's just a scribble. Do the work! It won't magically get easier just because you get some criticism. Look at references, there are tons of anatomy references out there. In the end you'll have to draw and draw and draw, look at references and draw some more. Once it looks more like this, it will be easier to criticize the anatomy. try some easier standing poses first and as mentioned follow some basic anatomy tutorials. Work your way into more complicated stances. sketch all these at higher resolution in brush mode with pressure opacity if u have. 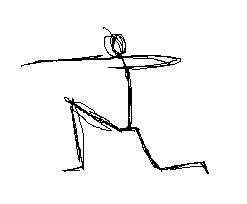 Do a bunch of sketches of stances then develop the best ones.